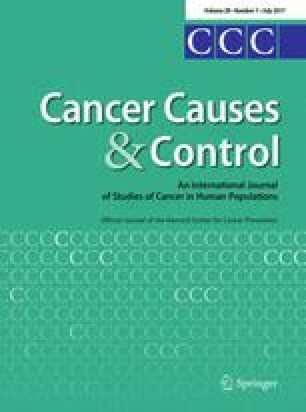 Smoking is a risk factor for mucinous ovarian cancer (OvCa) in Caucasians. Whether a similar association exists in African Americans (AA) is unknown. We conducted a population-based case–control study of incident OvCa in AA women across 11 geographic locations in the US. A structured telephone interview asked about smoking, demographic, health, and lifestyle factors. Odds ratios and 95% confidence intervals (OR, 95% CI) were estimated from 613 cases and 752 controls using unconditional logistic regression in multivariable adjusted models. Associations were greater in magnitude for serous OvCa than for all OvCa combined. Compared to never smokers, increased risk for serous OvCa was observed for lifetime ever smokers (1.46, 1.11–1.92), former smokers who quit within 0–2 years of diagnosis (5.48, 3.04–9.86), and for total pack-years smoked among lifetime ever smokers (0–5 pack-years: 1.79, 1.23–2.59; >5–20 pack-years: 1.52, 1.05–2.18; >20 pack-years: 0.98, 0.61–1.56); however, we observed no dose–response relationship with increasing duration or consumption and no significant associations among current smokers. Smoking was not significantly associated with mucinous OvCa. Associations for all OvCa combined were consistently elevated among former smokers. The proportion of ever smokers who quit within 0–2 years was greater among cases (23%) than controls (7%). Cigarette smoking may be associated with serous OvCa among AA, which differs from associations reported among Caucasians. Exposure misclassification or reverse causality may partially explain the absence of increased risk among current smokers and lack of dose–response associations. Better characterization of smoking patterns is needed in this understudied population. The online version of this article (doi: 10.1007/s10552-017-0899-6) contains supplementary material, which is available to authorized users. We would like to acknowledge the AACES interviewers, Christine Bard, LaTonda Briggs, Whitney Franz (North Carolina), and Robin Gold (Detroit). We also acknowledge the individuals responsible for facilitating case ascertainment at the 11 geographic locations across the 10 study centers including Jennifer Burczyk-Brown (Alabama); Rana Bayakly and Vicki Bennett (Georgia); the Louisiana Tumor Registry; Manisha Narang (New Jersey); Diana Slone, Yingli Wolinsky, Steven Waggoner, Anne Heugel, Nancy Fusco, Kelly Ferguson, Peter Rose, Deb Strater, Taryn Ferber, Donna White, Lynn Borzi, Eric Jenison, Nairmeen Haller, Debbie Thomas, Vivian von Gruenigen, Michele McCarroll, Joyce Neading, John Geisler, Stephanie Smiddy, David Cohn, Michele Vaughan, Luis Vaccarello, Elayna Freese, James Pavelka, Pam Plummer, William Nahhas, Ellen Cato, John Moroney, Mark Wysong, Tonia Combs, Marci Bowling, Brandon Fletcher, Yingli Wolinsky (Ohio); Susan Bolick, Donna Acosta, Catherine Flanagan (South Carolina); Martin Whiteside (Tennessee) and Georgina Armstrong and the Texas Registry, Cancer Epidemiology and Surveillance Branch, Department of State Health Services. The AACES study was funded by NCI (R01CA142081). Additional support was provided by Metropolitan Detroit Cancer Surveillance System (MDCSS) with federal funds from the National Cancer Institute, National Institute of Health, Dept. of Health and Human Services, under Contract No. HHSN261201000028C and the Epidemiology Research Core, supported in part by NCI Center Grant (P30CA22453) to the Karmanos Cancer Institute, Wayne State University School of Medicine, and NCI Center Grant (P30CA072720) to the Rutgers Cancer Institute of New Jersey. The funders had no role in the design, analysis, or writing of this article.